More than 1.6 Million English Banana.com Free English Books Downloaded since 2008! We recently had a count up and we’re excited to announce that (since April 2008) more than 1.6 million people have downloaded English Banana.com free English printable books! The actual total to date is 1,615,276 , which averages out at 1,224 free downloads every day over the past 3.5 years! This stat comes from the number of books downloaded from our pages on CNET and Scribd. 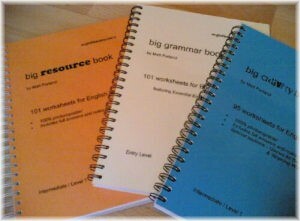 Check them out and maybe you will find something useful for either teaching or learning English! This figure doesn’t include downloads from other websites where the books are hosted as well, e.g. Google Books, Guardian Teacher Network, Slideshare, and other file-sharing sites – so the total number of English Banana.com books downloaded over the past few years will be actually much higher! The last time we did the count (about this time last year) the total figure was just over 820,000 books downloaded, which means that the number of people who have been able to benefit from our free material has more than doubled in one year! This is really exciting for us here at English Banana.com! The most popular free English Banana.com books – by a large margin – are Talk a Lot Elementary Book 1, and Big Grammar Book. We are absolutely thrilled to see that the material is being so widely distributed on the internet and used in many different teaching situations around the world. 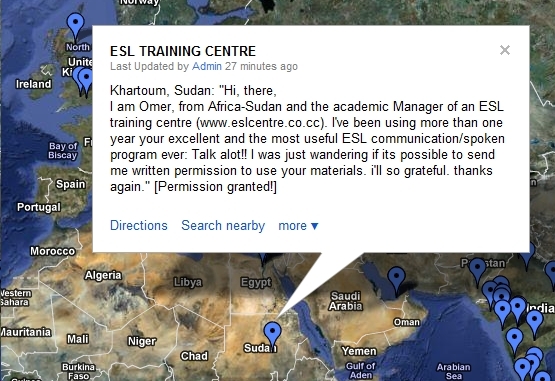 We love getting feedback every day from teachers and students who are benefiting from using the material. You can see some of the places where they are being used on this Google Map, and find out how people are using our free licences, which make the free material really FREE. If you are a teacher or student who enjoys working with English Banana.com material, why not email us a picture of yourself using it in the classroom. We’d love to see it! Categories: Books, Free Printable Worksheets, News, recommended, Talk a Lot | Tags: book, download, English, ESL, ESOL, free, learn, material, worksheets | Permalink. Categories: Free Printable Worksheets, New Material, News, recommended, Talk a Lot | Tags: download, EFL, ESL, free, free copying licence, material, new, Talk a Lot, vocabulary, worksheets | Permalink. Categories: Free Printable Worksheets, New Material, News, recommended, Vocabulary | Tags: download, English, ESL, free, get, grammar, material, vocabulary, worksheets | Permalink.